is enhanced ..... which makes the effective efficiency higher. quality front end and amplifier they will provide truly excellent sound. of music at a satisfying volume level with life sized instruments and vocalists. Amplifiers with more power can certainly be used, but are not needed. of the listening room needed for the Betsy baffles. range from 12' x 12' to 12' x 16' and report good results. a much larger room, even with a low wattage amplifier. 12' x 12' and are content with a "nearfield" listening position. wife was not agreeable to moving the audio system into that room. size of 12' x 12' to hear what these speakers are capable of. If your listening room is larger than that ..... all the better. the side walls on recordings with appropriate imaging content. and vocals with some electric instruments thrown in to the mix. to be "party speakers" ..... there are better choices for that type of listening. There are many ways to listen to music. For some, it is simply "background noise"
but most of my listening is done in a setting best described as a "private concert". in a way that is very involving and natural sounding. are no different in this regard. Garbage in ..... garbage out. to increase their music collection. very well regarded high dollar gear from just a few years ago. I recommend taking some time to experiment with speaker placement. in the quality of the image and the tonal balance. Speaker "toe in" is also important. For serious listening, place the baffles at least 3 feet from the front wall if possible. The light weight and rear mounted handles make moving the speakers easy to do. 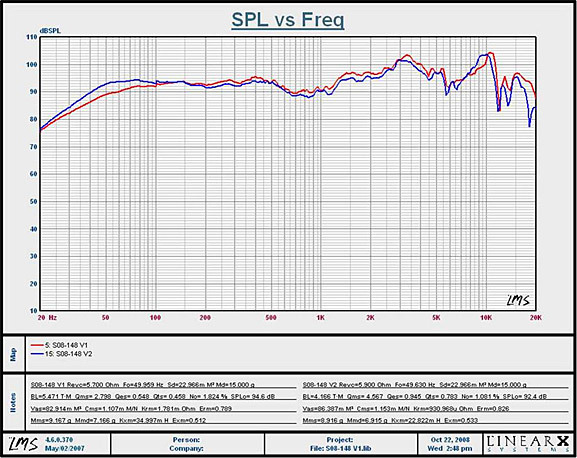 frequency response drops off pretty quickly below 80 HZ. Alpha 12" or 15" driver to create a "full range" open baffle system. The 15" model goes lower in frequency ..... the 12" model is faster and "tighter"
Open baffle bass has a natural sound and integrates well with the Betsy baffles. Conventional subwoofers can also be used and are easily integrated. corners of the room increases the perceived bass response. off around 12 or 13K by a few DB, but still has decent output to 20K. I rarely find myself wanting more high frequency output . are quite happy with the "civilized" top end from the Betsy drivers. harmonics of most instruments are rendered very well, in my opinion. might want to "tweak" the speakers to maximize the performance. Any of these modifications has the potential to change the sound of the speakers. speakers in their stock form before trying any of the above modifications. Please remember that "different is not necessarily better". Musicality is the ultimate goal.